This is the same as the Extra Stats v3.0 for RMVX, but converted for RMVXA. Version 1.3 has fewer features, but future versions will also contain RMVXA exclusive options. This is my first actual script for RMVXA and my first properly released (full) script for it. Just like the Extra Stats script for RMVX, this script adds a window to display several in-game statistics. To be honest, I only did this to see if I could do it. Inevitably, as a result, there are areas for improvement. It was made doubly more difficult by the fact that, since (prior to purchasing RMVXA) I’d been using the trial (Lite) version of RMVXA, and writing the scripts directly in its editor isn’t possible. Instead, I used a combination of Notepad and the "RMVX workaround" to produce a working script. This is actually a big deal for me because it’s a measure of my scripting progress (which a lot of die-hard scripters take for granted! ), so as my knowledge of RGSS/Ruby increases so too will my ability to script. In this version, there are no additional features. However, in the next (currently unreleased) version, there is a feature to call the Stats window from the map by pressing a predetermined key. The manual is not available yet, but it will be when v2.0 is released. 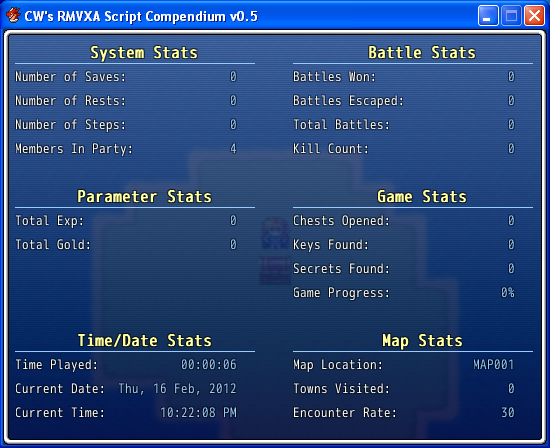 Most of the stats in the RMVX version will be added to the RMVXA script. Future updates will also include RMVXA exclusive stats. One feature that has been suggested is to add stats to show enemies killed by specific weapons, which I will definitely be looking into. Future updates may also require the Global Colors Module (GCM) and the RMVXA equivalent of the Universal Configuration Settings Module, depending on a number of factors.